I’m so excited to introduce everyone to an extraordinary steampunk author. I’ve seen snippets of the “Moses: The Chronicles of Harriet Tubman”and I can’t wait to read it. I love books that are filled with action, interest, and have strong characters of color. Please take a look at this neat interview. Meet Balogun Oyabode Abeegunde. What’s your favorite steampunk book, movie, or TV show? My favorite steampunk movie is The League of Extraordinary Gentlemen; my favorite TV show is, of course, Wild Wild West. My favorite steampunk book is “Moses: The Chronicles of Harriet Tubman (Book 1: Kings)”, by Yours Truly. I also love “The Switch” by Valjeanne Jeffers. Jules Verne’s’ “20,000 Leagues Under The Sea” is pretty good too. Why is it important for African-Americans to participate in reading and/or writing steampunk? 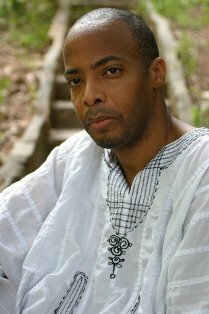 It is important for authors of African descent around the world to write all genres of speculative fiction because we are not seen in these stories. I believe the literacy rate among us would increase tremendously if we had characters and settings we could relate to in speculative fiction novels. In the steampunk subgenre we mainly see Caucasian heroes and (sometimes) heroines in Victorian clothing, speaking English with a British, French or other European accent and acting very…”European” for lack of a better term. The rare person of color is usually the hero’s sidekick or the villain’s brutish minion. We don’t relate to these stories, so we do not read them. With “Moses: The Chronicles of Harriet Tubman”, I am doing my part to change that. Tell us about the Moses Chronicles. What’s the series about? “Moses: The Chronicles of Harriet Tubman” is a book series that tells the story of Harriet Tubman immediately after the end of the Civil War. In the first book, Harriet – who is in desperate need of money to care for herself and her elderly parents – is given an opportunity to make a huge sum of money for undertaking a dangerous mission in the volatile South, where she is a wanted woman. She takes the assignment – rescuing a young girl named Margaret – but quickly realizes that the mission was a set up. She is now wanted by one of the most powerful men on the planet, who hires a team of assassins who possess extraordinary abilities to hunt her down and kill her. Harriet must rely on her wits, fighting prowess, an arsenal of gadgets and weapons and her own extraordinary abilities, which she attributes to being “brushed” by the Hand of God. Along the way, Harriet encounters – and often comes into conflict with – well-known figures from history and creatures of legend. What inspired you to write the Moses Chronicles? Harriet Tubman is one of my idols. I also consider her to be the first modern “superhero”. There are true stories about her that are amazing. While returning home, after serving as one of the greatest spies and warriors in the Civil War, Harriet was told she could not ride in a train car with Caucasians. She refused to move and was attacked by five men, whom she defeated after they broke one of her arms. Harriet was also known to have accurate visions and seemingly could change her appearance. Harriet – who was a petite woman – has been described by witnesses and by those seeking her capture as everything from a very tall man to a portly old woman. These types of stories inspired me to write “Moses: The Chronicles of Harriet Tubman”. Our great ancestors live on through our memories of them; through the tales we tell. None deserve that more than Harriet Tubman. How do you intertwine history/culture in your steampunk world? Of course, Harriet Tubman is a historical icon. Abraham Lincoln, John Wilkes Booth, Secretary of War, Edwin M. Stanton and others all play important roles in the world of “Moses: The Chronicles of Harriet Tubman”. The world is historically accurate, but I have played with the characters a bit. I have explained certain events in history that were – up until now – unexplained or contained mysterious elements with interesting twists. I have tried to remain true to the style and parlance of the day, but the world is a bit darker and a lot more exciting than in real life. Could you share some of your most interesting gadgets or inventions? In the series, readers will meet a fellow by the name of Baas Bello. Baas is an African man who possesses a genius beyond anyone on the planet. He is the creator of The Nefertiti – an airship created from a steam train engine. The Nefertiti is one of my favorites, as I am fascinated by airships and by steam trains. Baas is also the creator of the first subway train, inspired by the idea of the Underground Railroad for which he and Harriet Tubman worked. How do readers purchase the Moses Chronicles? Readers can purchase “Moses: The Chronicles of Harriet Tubman” as an e-book through my publisher – Mocha Memoirs Press – at www.mochamemoirspress.com. Any parting thoughts or information that you’d like to share? Please, treat yourself to “Moses: The Chronicles of Harriet Tubman”. You will enjoy the fast-paced story, the twists and turns, the elements of the fantastic and the horrific. Read it and please, give me feedback. Also, look for my novel “Once Upon A Time In Afrika”, which is written in the genre of Sword and Soul, in the spring. It is published by MVmedia, the publishing company owned and operated by renowned author of Sword and Soul, Milton Davis. Thank you for this opportunity, Alicia. Balogun Oyabode Abeegunde is the author of the bestselling “Afrikan Martial Arts: Discovering the Warrior Within” (non-fiction), “Moses: The Chronicles of Harriet Tubman” (Steampunk) and the feature film, “A Single Link”.